Do-gooder teenagers have built an incredible tiny home community for homeless adults in Seattle. The project, called Impossible City and run by Sawhorse Revolution, teaches teens basic construction and green energy skills to help them help their community. Together, they’ve created a series of efficient and comfortable tiny homes for the Nickelsville community that serves the homeless of Seattle. In the vein of programs such as Habitat for Humanity, Sawhorse Revolution helps to recycle leftover construction materials into livable tiny homes, often employing off-the-grid, sustainable features like solar panels and rainwater harvesting. With the skills they’d learned, the teenagers who participated in the program realized they could help Nickelsville; a roaming homeless community that occupies vacant land on a temporary basis. 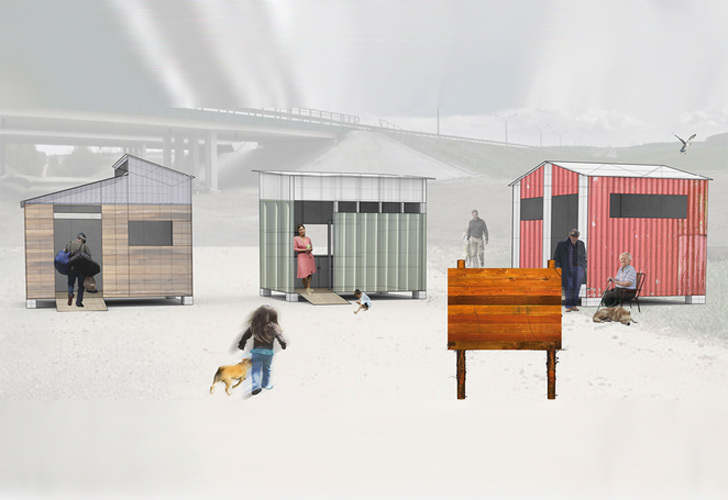 Launched with an Indiegogo campaign, the teens have teamed up with designers to create a moveable eco-village for Seattle’s homeless. With the help of designers, the teens have created six projects that will enhance the life of the people living in Nickelsville, including The Green House—a tiny home made of salvaged aluminum sights, and The Nest—a similar tiny house with a loft and built-in shelving. They’ll also be able to build a sheltered open kitchen, solar power charging station, composting latrines, and collapsible tiny homes made from recycled canvas and other materials. These ambitious projects will not only increase the quality of life for the homeless living at Nickelsville, but can also be easily moved when the camp is forced to relocate. The teens have already successfully raised enough funds to begin their initial plans, and continue to raise more to expand Nickelsville. In the vein of programs like Habitat for Humanity, Sawhorse Revolution help to recycle leftover construction materials into livable tiny homes, often employing off-the-grid, sustainable features like solar panels and rainwater harvesting. With the skills they’d learned, the teenagers who participate in the program realized they could help Nickelsville, a roaming homeless community that occupies vacant land on a temporary basis. 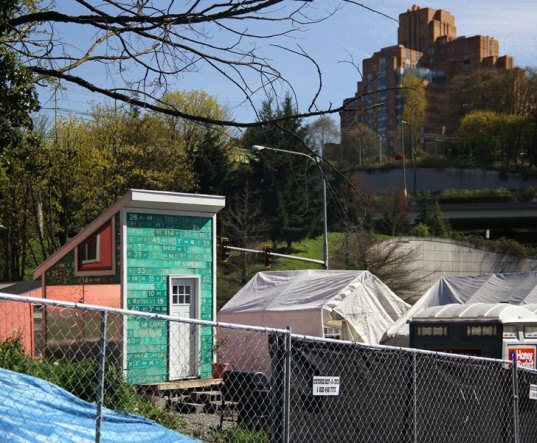 Launched with an Indiegogo campaign, the teens have teamed up with designers to create a moveable eco-village for Seattle’s homeless. With designers, the teens have created six projects that will enhance the life of the people living in Nickelsville, including The Green House, a tiny home made of salvaged aluminum sights, The Nest- a tiny home with a loft and built-in shelving, a sheltered open kitchen, a solar power charging station, composting latrines, and collapsible tiny homes made from recycled canvas and other materials. These ambitious projects will not only increase the quality of life for the homeless living at Nickelsville, but can also be easily moved when the camp is forced to relocate. The teens have already successfully raised enough funds to begin their initial plans, and continue to raise more to expand Nickelsville.